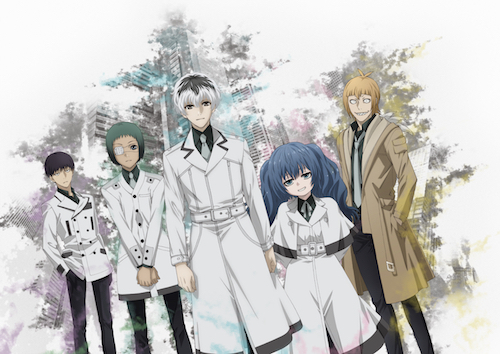 Anime Ltd acquires “Tokyo Ghoul: re”. Simulcasting to the UK & Ireland April 2018 at Crunchyroll. Tokyo Ghoul is a franchise we have a close affinity to here at Anime Ltd. We brought the first two seasons of the anime to the UK, screened the live-action movie in cinemas and we were the first English speaking territory to release the two OVA episodes “Jack” & “Pinto” on Blu-ray and DVD. Read on below for details on the series. Haise Sasaki has been tasked with teaching Qs Squad (note from Anime Ltd: Qs is read as “Quinx”) how to be outstanding investigators, but his assignment is complicated by the troublesome personalities of his students and his own uncertain grasp of his Ghoul powers. Can he pull them together as a team, or will Qs Squad first assignment be their last? Don’t forget that we’ve released the first two seasons and “Jack” & “Pinto” OVAs of Tokyo Ghoul on Blu-ray and DVD! So now is the perfect time to do a catchup and be primed for the upcoming season! We hope you’re excited for Tokyo Ghoul: re! When the episode will be released? It’s still not available on Crunchyroll.